I’m happy to introduce you to another delicious Korean side dish called kkwarigochu-jjim. Kkwarigochu are known as shishito peppers. 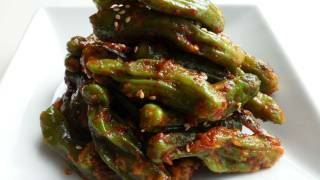 The light green and thin-walled green peppers are small and sweet and milder than most, so Korean cuisine uses the peppers whole. When I make my kkwarigochujjim, it never lasts long even though I make a lot of it. I can’t help eating and eating it until it’s gone. I eat it as a snack! I love the texture of the side dish. It’s popular for making doshirak (lunchboxes). I’ll also show you how to arrange a real Korean dosirak. Kkwarigochu (shishito peppers), flour, garlic, sesame oil, sesame seeds, green onions, dried anchovies, soy sauce, honey, and hot pepper flakes. Prepare 300 grams (about 10 ounce : 0.7 pound) of kkwarigochu and remove the stems from each pepper. Wash the peppers and strain them. Place the strained peppers in a large bowl and add 3 tbs flour (use 1 tbs flour for every 100 grams of kkwarigochu). Mix it up with your hands until the peppers are coated in flour. Put 1 cup of water in a steamer pot and boil it over high heat. After the water boils for a few minutes, put the peppers into the steamer and steam for 5 minutes over high heat. Turn off the heat, take off the lid, and set aside. Put a pan on the stove over medium heat. Add 1 ts sesame oil and 2 cloves of minced garlic to the heated pan. Stir for a few seconds with a wooden spoon. Add 6 large dried anchovies with the heads and guts removed and stir for 10 seconds. Add ¼ cup water, 3 tbs soy sauce, and 1 ts honey (or sugar) and stir. Lower the heat and simmer the sauce for 1-2 minutes. Add 3 ts hot pepper flakes and mix it up with a wooden spoon. Add the steamed peppers to the sauce and mix it up well with a wooden spoon. Mix for about 1 minute. Turn off the heat and add 2 chopped green onions and 1 ts sesame oil. Mix it together. Transfer some to a plate and sprinkle roasted sesame seeds on top before serving. Serve with rice. The leftover can be stored in the fridge up to 2-3 days. You wanna make the same dosirak as I did in the video? Here you go! Posted on Wednesday, July 20th, 2011 at 3:35 pm. Last updated on October 15, 2017. Posted August 18th, 2017 at 6:26 pm | Log in to reply. I just made this from the shishito peppers I grew in my garden! It was soooo yummy and tangy and spicy and salty with a little sweetness from the honey and the fragrant sesame oil. We it ate with lettuce salad, kimchi, doenjang jigae, and rice. Delicious! Posted August 23rd, 2017 at 11:10 am | Log in to reply. Shishito peppers are milder than other peppers, so you can use them in many ways. I’m glad to hear that you like this recipe. Posted November 6th, 2015 at 6:18 pm | Log in to reply. Is it okay to not use flour? What would be the difference between using the flour and not using the flour? Posted November 6th, 2015 at 7:03 pm | Log in to reply. You can replace flour with rice flour or sweet rice flour. Posted April 6th, 2015 at 11:37 am | Log in to reply. Posted November 6th, 2015 at 7:04 pm | Log in to reply. Yes, you can use any types of green chili peppers. If the peppers are too big, cut them into bite size pieces. Posted January 6th, 2015 at 6:13 pm | Log in to reply. Hi Maangchi , I love this recipe . I wonder if all side dishes could be stored for a month? Posted January 7th, 2015 at 8:51 am | Log in to reply. No, it will be ok up to 3 days. Posted February 24th, 2014 at 8:20 pm | Log in to reply. Do I store this in the refrigerator or at room temperature? Posted February 25th, 2014 at 9:35 am | Log in to reply. yes, store in the refrigerator up to 3 to 4 days. Good luck! This recipe was originally posted on July 20, 2011 at 3:35 pm by Maangchi. It was last updated on October 15, 2017. The video was watched 195,878 times on YouTube & has 2,036 likes!